It’s not the sights or sounds of Marrakech that I remember, but the smell. That warm, heavily perfumed, smell. It’s an aroma that had followed me home after my last visit to the city; a wholly Moroccan scent that had settled over my house for months after. Unpacking my suitcase – bags filled with golden saffron falling out – it had smelt like rose oil and cumin, and had clung determinedly to my clothes and skin. It was a smell that I’d almost forgotten about – until last week, that is. Stepping into Marrakech’s medina, the first TTT Tour to Morocco underway, the city’s undeniable aroma was the first thing that I recognised. After months of planning, TTT Tours had finally received its launch. 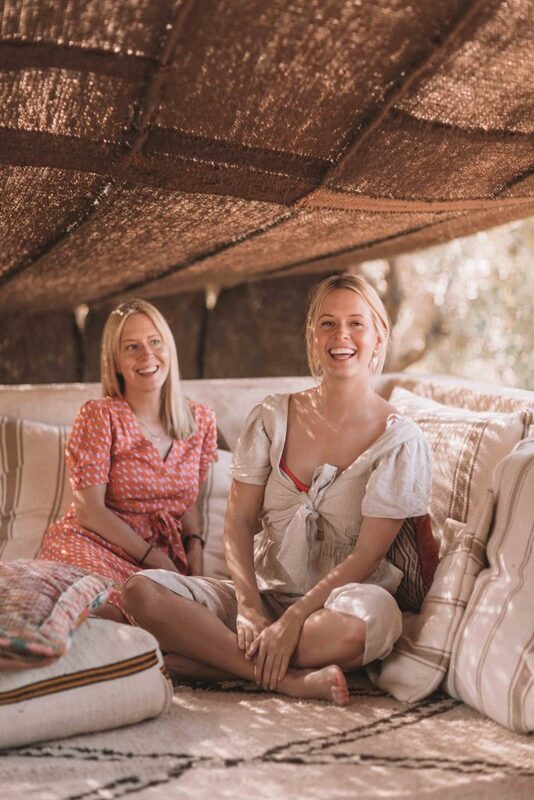 Under the hot North African sun, we were to spend five days with ladies from across the world; exploring souks and sun-baked alleyways, ruddy desert landscapes and flowery countryside retreats. 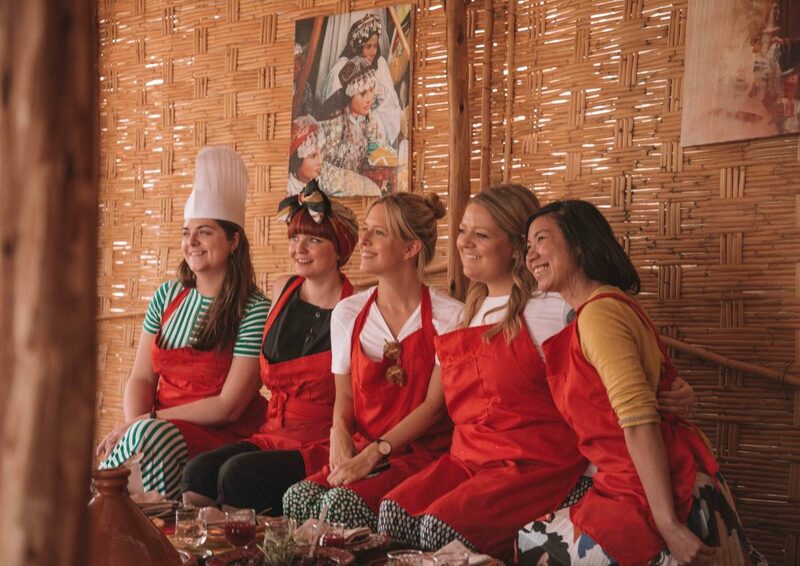 Surrounded by that familiar scent of perfume and spices, it was a tour that brought together women both inside and outside of the country: a whole five days championing the brilliance of female travel. Below is a summary of our TTT Tour to Morocco; a tour that we will be running again, alongside adventures to new destinations. It was a trip that led us from lantern-filled rooftops to candle-lit deserts; from crowded souks to lonely plains. With the swirling Saharan sands and scent of orange blossom in the air, it was a tour that – like that distinctly Moroccan scent – I’ll never forget. 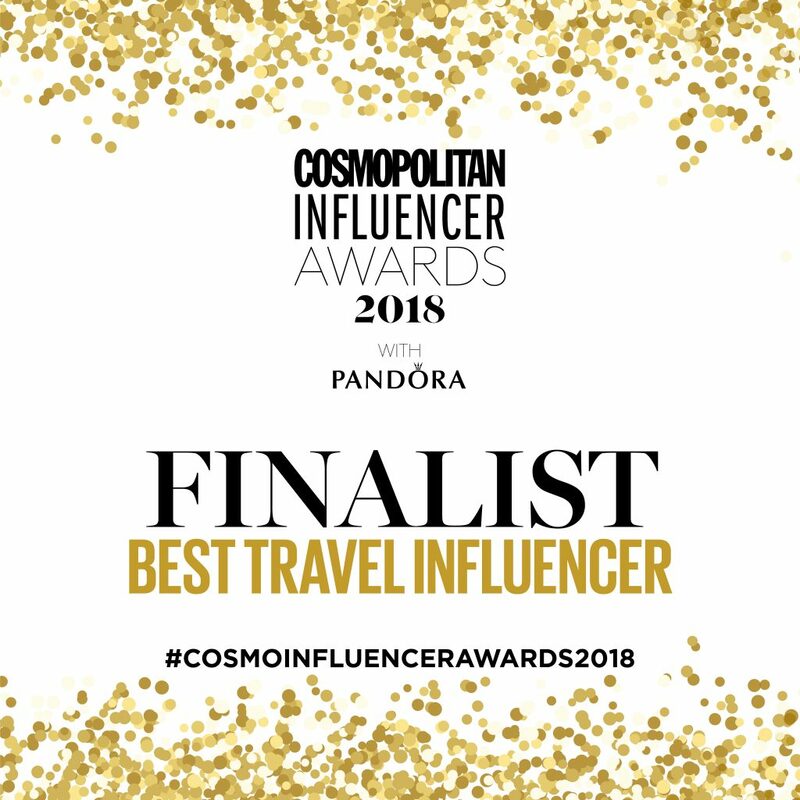 When discussing how to make TTT Tours a reality – empowering women to travel to unfamiliar destinations, and supporting in-country female initiatives while there – we quickly realised that we needed an expert hand to guide us. Cue the support of Intrepid Travel. With over thirty years’ worth of experience planning bespoke, enriching and small group adventures, Intrepid Travel have been indispensable in ensuring that our tours follow the best itineraries, and are supported by local and in-country guides. 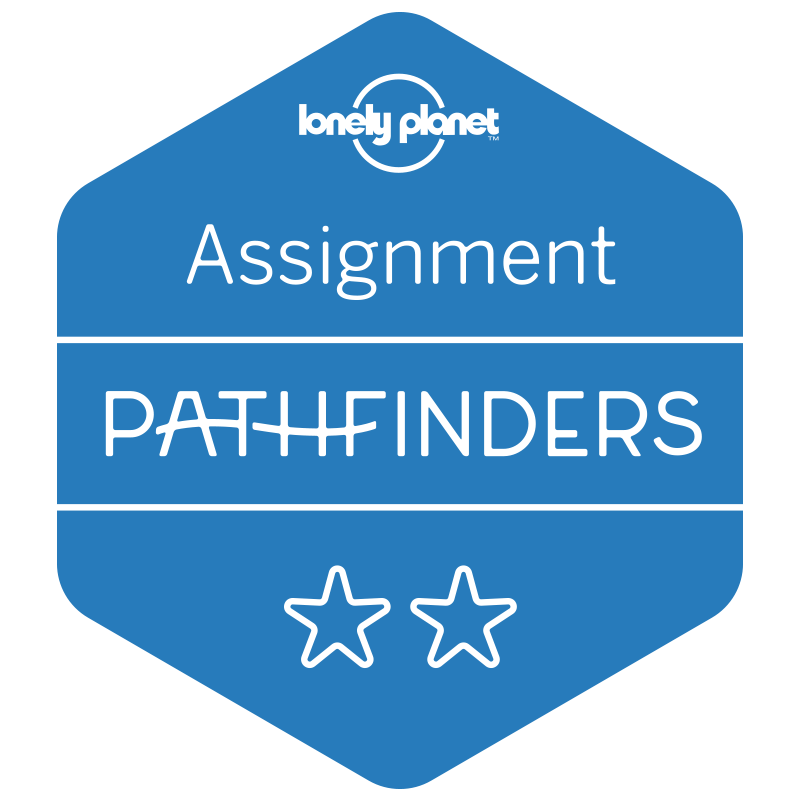 I can’t quite imagine how stressful it might be to try and plan these itineraries single-handily, and so working with Intrepid Travel has not only saved us many headaches – but our sanity. Included: hotel transfers, food tour & guide, Intrepid Travel guide, hotel stay and breakfast, dinner at Nomad restaurant. We landed in Marrakech airport at 11am; the UK contingent having already met at Gatwick airport the night before. The flight, with British Airways, was surprisingly short – North Africa lying just a stone’s throw from the mosaicked arches of Seville and Grenada. After a flurry of introductions and the odd glass of wine, we arrived three hours later; the sandy tip of Africa welcoming us with hot sun and desert winds. Morocco’s airport – a vaulted, beautiful art-deco building – was incredibly easy to navigate and after exchanging some money (Morocco has a closed currency, meaning you cannot change money until you are in the country), we met our guide and clambered into our mini bus. From here, it was just a short drive to our hotel for the next few days: the boutique 2Ciels Hotel. 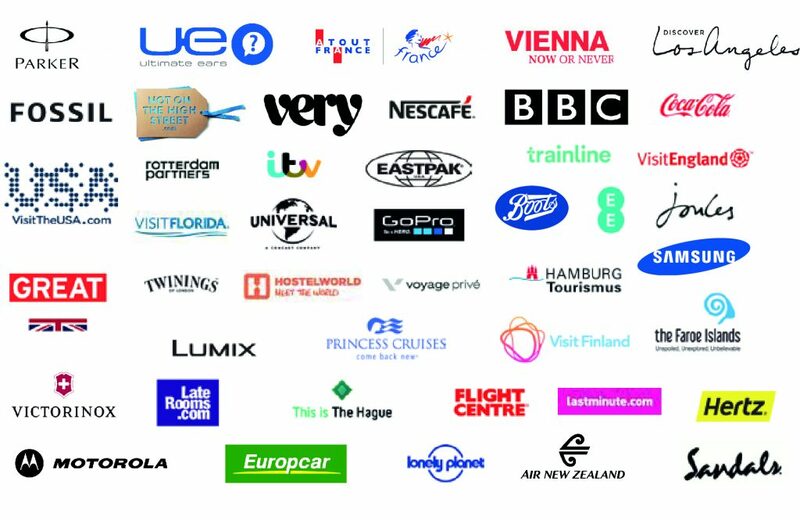 When planning our first TTT Tour, we were asked by Intrepid Travel what level of ‘luxury’ we wanted to provide our guests. 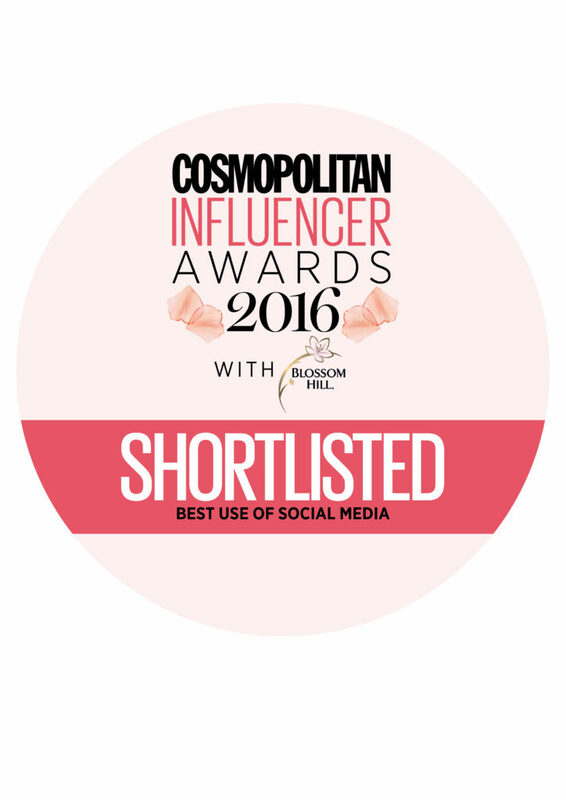 Were we budget queens or luxury divas? 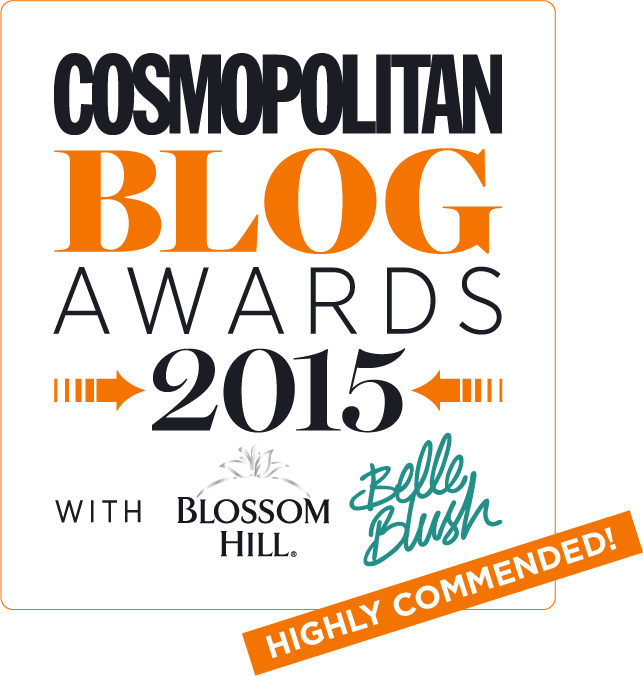 Our guess was that we – alongside the majority of ladies our age – were somewhere in between. Whilst roughing it might hurt my back, going too high end would definitely harm my bank balance. 2Ciels Hotel therefore provided us with the perfect compromise: a 4* luxury hotel based in Morocco’s ‘New Town.’ Featuring a rooftop bar, spa, infinity pool and large, cool interiors, the hotel was (dare I say it), even nicer than I’d been expecting. 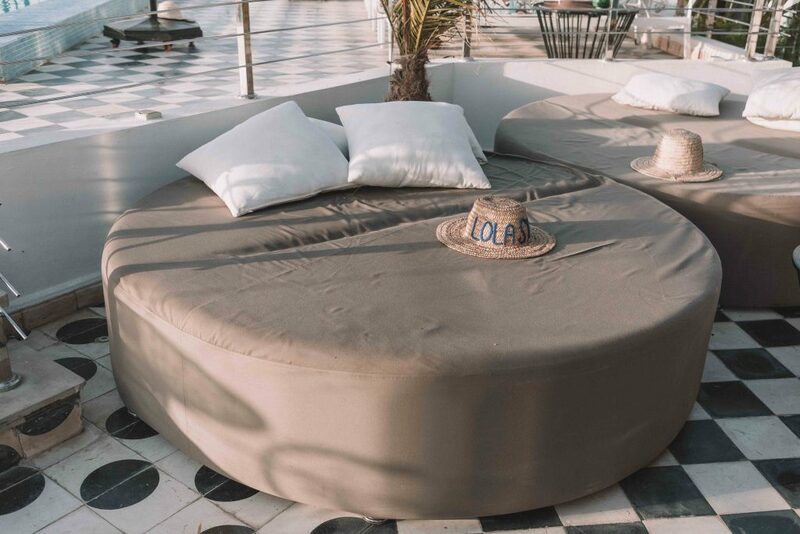 Heading straight to the hotel’s beautiful rooftop – Lola Skylounge – we were afforded incredible views across the city, with the soaring peaks of the Atlas Mountains visible in the distance. Ordering a few drinks and sitting back in the midday sun, we waited for our gang of US ladies to arrive – all of whom had arrived the day before. Whilst there, we browsed the hotel’s spa treatments (including a traditional ‘Hammam’ option) and panic applied sun block. Eventually, our group was complete as our US ladies arrived to meet us. There was a lot of hugging going on – and the repeating of names – due to the fact that our group included three sets of identical twins. 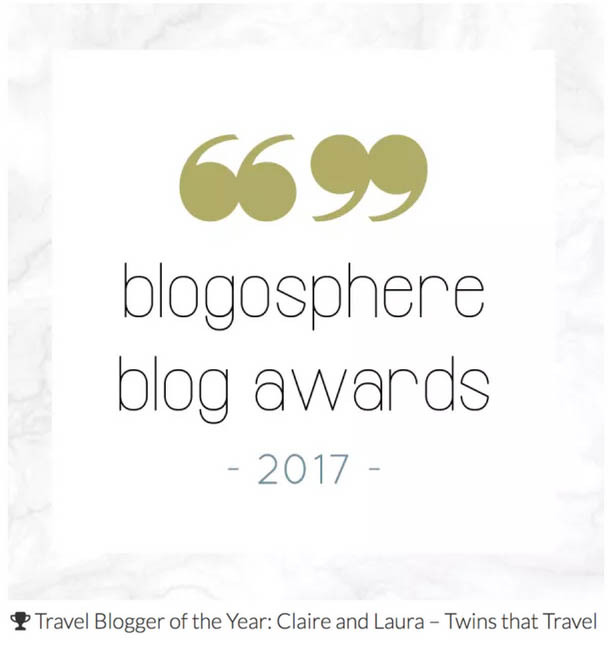 Considering that TTT Tours are aimed at celebrating female travellers, we couldn’t have asked for a more inspiring group of ladies to kick-start things. Including a humanitarian worker based in Afghanistan, two NGO workers from Washington DC, a city worker in London, a creative director, an airplane engineer and two auction house experts, this group of women left me feeling only vaguely insecure about my own career path. It was an absolute privilege to spend five days with them all; seeing Morocco together as a glorified girl band. At 4pm, it was time to begin proceedings: our official tour guide – Tariq – now at the hotel. 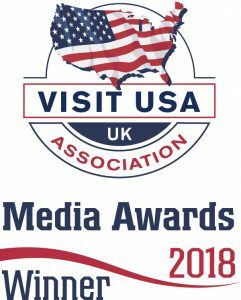 Tariq had been recommended by Intrepid Travel and would stick with us for the next five days. And stick he did. Tariq – for his sins – was the loyalist of guides: organising, arranging and helping us every step of the way. Ever on hand with medicine for unhappy tummies and poised to take endless photos of us all, he was patient, kind and brilliant fun. Tariq now leading the way, our mini bus arrived and promptly whisked us into the heart of Marrakech: the medina or ‘old town’. The beating heart of the city, the medina – also known as the ‘red city’ – often poses as Morocco’s caricature: an irresistibly busy, perfumed, vibrant and overwhelming place, lined with babouches (leather slippers) and magic lamps. It’s a place that had dazzled and enchanted me on my last visit, and was an experience that I couldn’t wait to share with our group. 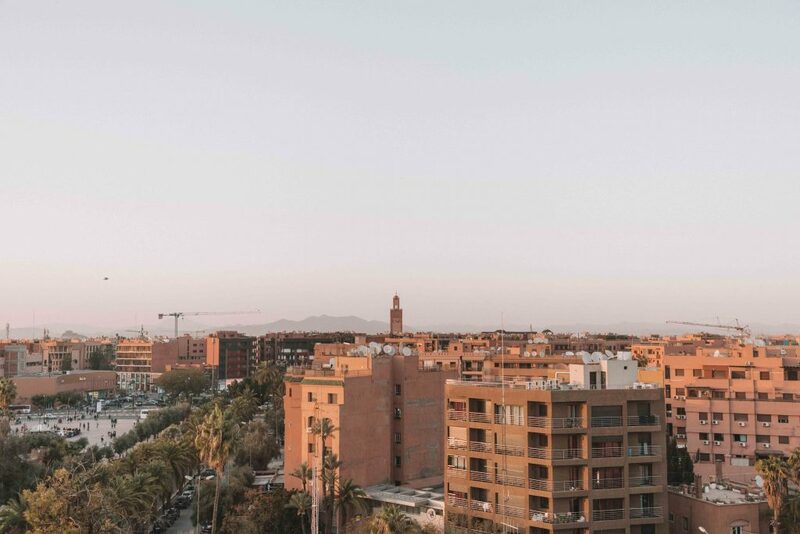 Founded in 1062 by the Almoravids, Marrakech’s history is as long as it is vibrant. Now a UNESCO heritage site, the city’s medina is a labyrinth of serpentine lanes, ochre coloured walls and dappled light – hanging rugs and scarves filtering the sunshine. Filled with centuries old buildings and artefacts, including the city’s original walls (or ramparts), the Badiâ Palace, the Ben Youssef Merdersa and Les Saâdians Tombs, Marrakech is an open air museum like no other. Yet, our introduction to the city would not come via its intricately mosaicked mosques or highly adorned palaces, but by something else entirely: its food. 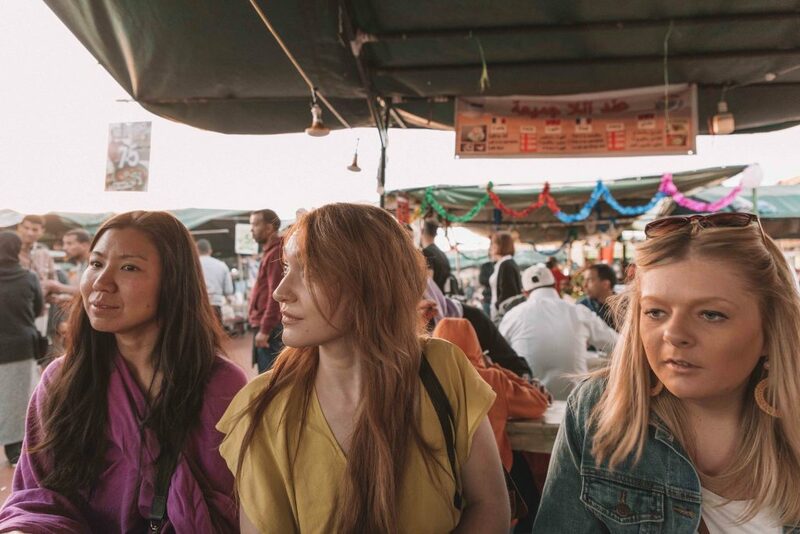 Joined by a second guide, we began a three hour deep dive into Moroccan cuisine: stopping by market stalls and street vendors, restaurants and bars. Beginning at an unassuming restaurant on the edge of the medina – one filled with locals enjoying sweet smelling tea – we were presented with piles of freshly grilled ‘M’smen’: a crepe like dish filled with rich, savoury condiments. Next to these arrived heaped baskets of freshly fried ‘Svenj’ – or Moroccan doughnuts. More savoury than their American counterpart, these soft, light treats were perfectly complemented by the endless pots of mint tea we were served. From here, we were taken further into the medina, eventually emerging in the famous Djemaa El Fna square. Its name – meaning ‘assembly of the dead’ – is thankfully no longer relevant, the square now a lively public space rather than popular execution spot. 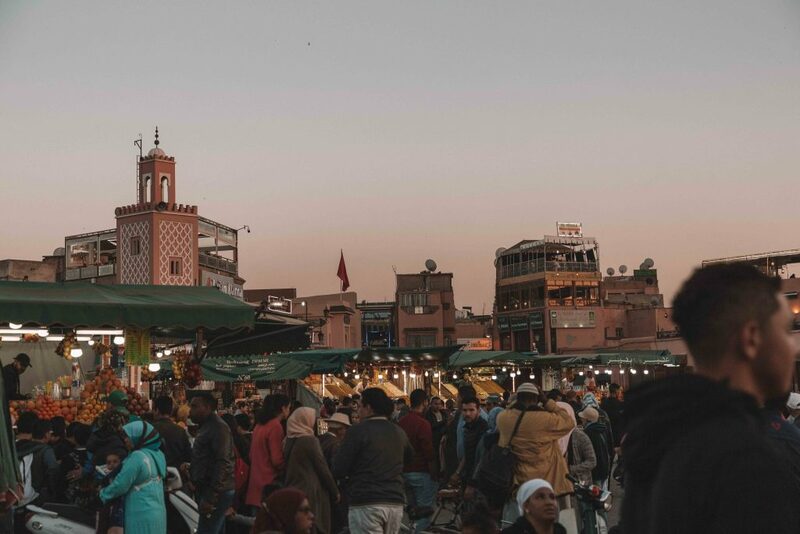 Filled with a dizzying number of food stalls selling fresh juices (Marrakech’s orange juice is as famous as its souks), gawping sheep’s heads, sizzling kebabs, snail soup and sugary mounds of ‘B’stilla’ (a sweet and savoury pie), the square is an unmissable spot for any foodie. 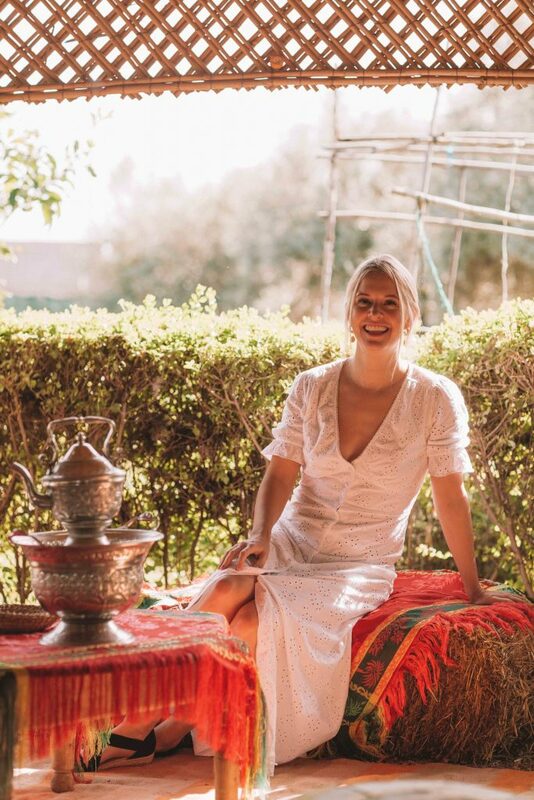 Sitting down under a canopied stall – surrounded by street performers, snake charmers, story-tellers and dancers – we tucked into bowls of traditional ‘Harira’, a Moroccan soup, before heading back into the throng of the souks to sample fresh olives and delicate sesame pastries. 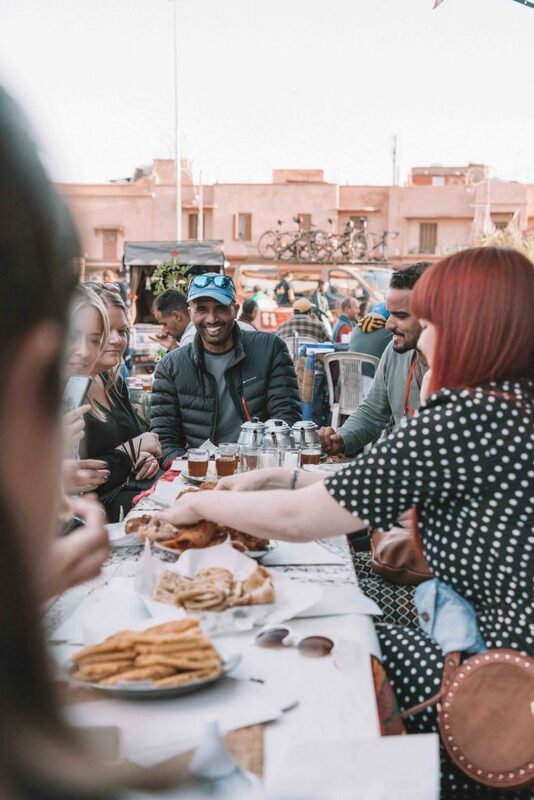 The tour was a brilliant introduction to Marrakech – a city upheld as much by its local delicacies as its haggling traders and bustling stalls. Unbelievably, and after three hours of eating, we next headed to the final stop of the day: dinner. 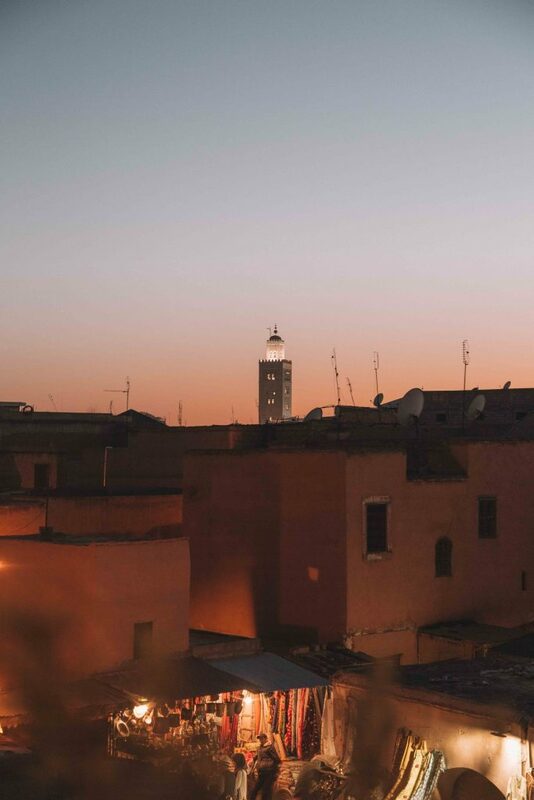 Dusk now settling over Marrakech, the Call to Prayer drifted hypnotically from the city’s minarets. Glowing against the bruised blue sky, each minaret appeared like a tiny palace; pink and orange, red and gold. Passing through the souks as the calls faded, we eventually reached a small doorway; climbing a staircase until we reached a glittering rooftop – Nomad. Offering unbelievable views across Marrakech’s gleaming cityscape, Nomad’s rooftop terrace was filled with glowing lanterns; each strung carefully above our heads. One of the city’s most popular restaurants, we ate aromatic tagines and piles of couscous as dusk faded into night: swallows and fruit bats diving overhead. It was the perfect spot to end the first day of the TTT Tour to Morocco. Included: Hotel stay and breakfast, cookery class and transport, a souk tour and guide, an Intrepid Travel guide. 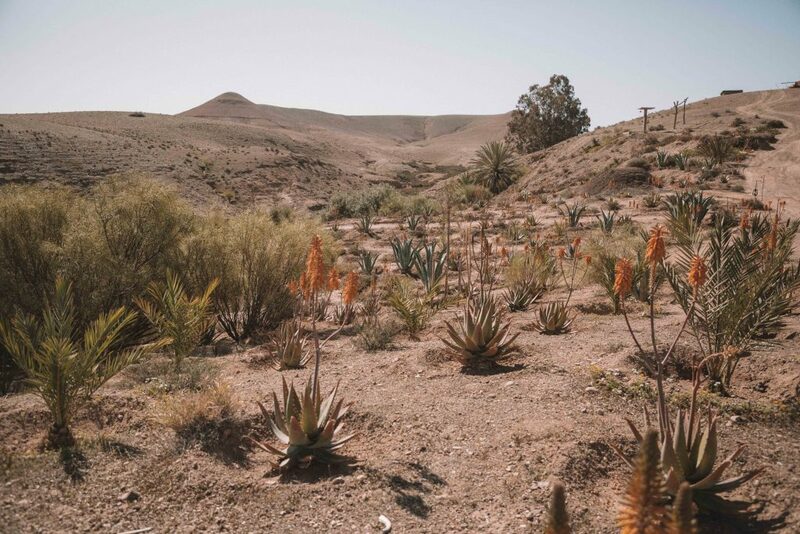 After a leisurely breakfast at 2Ciels Hotel, we were ushered into our mini bus and out of the heat of Marrakech; the Moroccan countryside calling. Leaving the ebb and flow of the medina behind, it was as though somehow had turned a dial down – the noise of Marrakech suddenly falling away. Replacing the busy alleyways were large orchards of silvery olive trees and flashes of orange groves. Winding down the windows and letting the warm air blow in, we could hear the sound of bells, as herds of goats and sheep passed by; their owners lagging behind in wide-brimmed hats. Now 30km outside of Marrakech, we eventually turned down a dirt track near Douar Dchiera, eventually arriving in front of a lush, green archway. In front of it stood a beautiful, smiling woman: waving as we climbed out. It felt a little bit like arriving at the Gardens of Babylon: flowers and butterflies surrounding her. Atelier Chef Tarik, a farm-based cookery school, offers guests not only the opportunity to try their hand at Moroccan cooking and gardening, but is also a dedicated social enterprise. Using cooking to ‘break down hierarchies’, the school hires women from the neighbouring villages, providing them with careers and skills. Our chef for the day, Ruqayya, led us to a coloured tent: dappled sunlight dancing over brightly stitched rugs and baskets of wild flowers. With only the sound of the nearby cockerels and humming bees for company, we were struck by just how peaceful – how idyllic a place – Atelier Chef Tarik was. 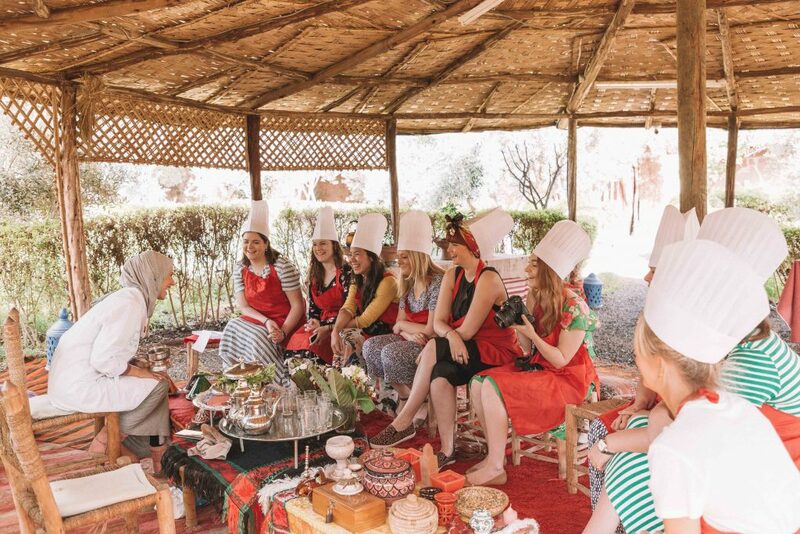 Settling down in our complimentary aprons and hats, our morning began with a traditional Moroccan tea ceremony. Carefully explaining to us the many herbs and flowers that go into the ‘Royal Blend’ of mint tea, Ruqayya compared the Moroccan tea ceremony with British proceedings. “In England, you just boil a kettle, dunk a tea bag in and then you’re done”, Ruqayya said, visibly disturbed. “You drink it standing up and sometimes completely on your own”. We each nodded solemnly, feeling increasingly guilty about our lacklustre approach to tea making. “That would never happen here”. In Morocco, the tea ceremony demands patience, time and socialisation: a chance for the entire family to catch up whilst the kettle slowly boils over burning charcoals. Making the tea takes time, as traditional green tea leaves are blended with herbs such as spearmint, sage, wild geranium, wild thyme and lemon verbena. Eventually, the tea is poured from a height (at least 12 inches), before being returned to the ‘berrard’ (pot) and washed through, ensuring a perfect blend. After sampling the (delicious) tea and having been treated to an introduction to the many spices involved in Moroccan cooking, we were led to the kitchen. For the next few hours, and under Ruqayya’s expert guidance, we cooked three tagines: chicken, lamb and vegetarian. Cooked within traditional clay tagines, over smouldering open fires, the smell of each dish was mouthwatering: a distinct blend of cumin, cinnamon and ginger. Before we tucked in, we were provided with one last treat: bread from a traditional Moroccan bread oven. The breads baked in Morocco, also known as ‘Khobz’, accompany nearly every meal and are cooked not in an oven, but over a hot stove. Settling down under the warm afternoon sun, we watched as women from the local villages kneaded and prepared our breads: eventually presenting us with beautifully warm, soft loaves. Eaten alongside our now cooked tagines (delicious, if I do say so myself), we enjoyed a final blissful hour at Atelier Chef Tarik: sharing stories and relaxing into this easy way of Moroccan living. Leaving the quiet of the countryside behind, we returned to Marrakech and the chaos of the medina. As the afternoon sun shone overhead – our shadows growing longer – we were led around the hidden spots of the city’s many souks. Leaving the ‘new town’ for the ‘old town’, visitors will immediately notice just how much cooler the medina feels: up to ten degrees cooler, in fact. This isn’t a coincidence. The medina’s winding streets are not just the result of haphazard planning, but are in fact deliberate. In causing the air to constantly bend and flow through these meandering alleyways, the air within the medina has no choice but to keep moving; creating an ancient air conditioning system. It is surprisingly effective. 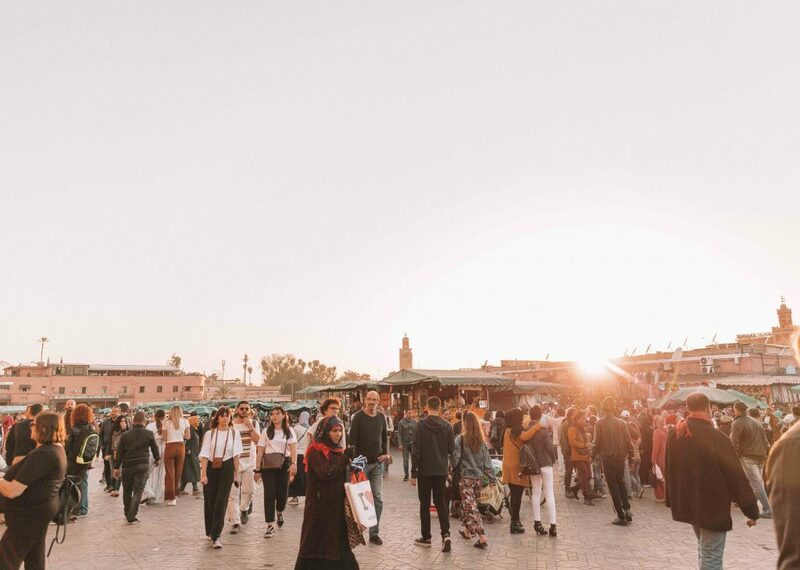 Walking past ancient mosques and through small squares filled with trailing jasmine plants and sleeping cats, the souk tour was a brilliant insight into the history and diversity of Marrakech’s crowning jewel – its old town. After a busy day, we returned to the hotel at 5pm and had the rest of the evening free. Perhaps inevitably, we all ended up on 2Ciels Hotel’s rooftop – enjoying dinner under the stars, alongside a cocktail or two. Included: breakfast, transfers, overnight stay at La Pause, camel ride and dinner. 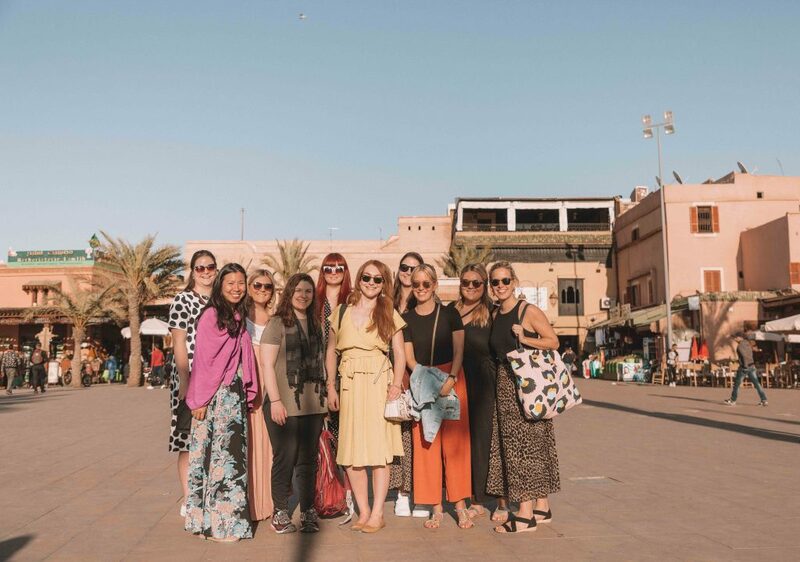 After a morning of free time (the group either sunning themselves by the pool or enjoying a spa treatment), it was time to leave Marrakech behind altogether – this time heading into the heat of Morocco’s Agafay Desert. 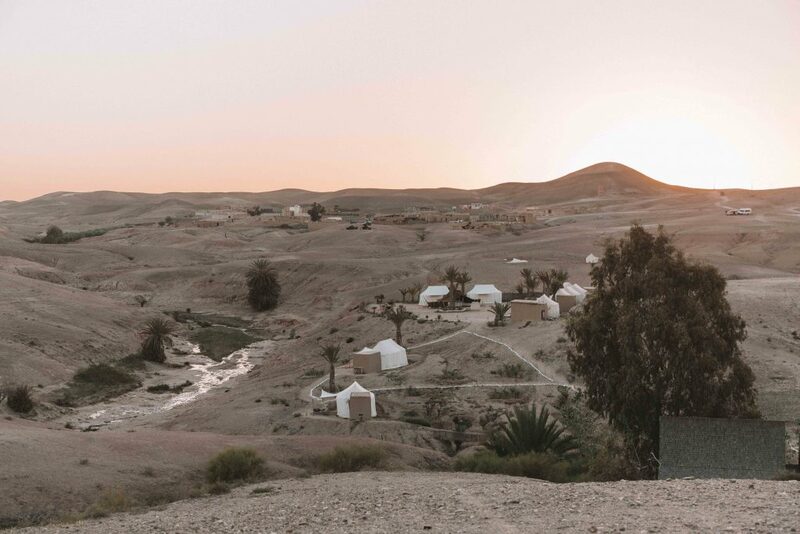 Thirty km from Marrakech, and under the watchful eye of the ruddy Agafay Mountains, lies La Pause – a surreally serene camp hidden in the middle of a lush, green oasis. Our transfer to the camp, which came courtesy of three black SUVs, took us away from the main roads of Morocco and over the crests of rocky dunes; hot earth and sand clouding our view. Eventually, and after 50 minutes, our guides pointed us towards a small valley: a crop of palm trees visible in the distance. “That will be your home for the night”, Tariq told us. Arriving at La Pause felt like arriving on a film set: the billowing sound of the canopied tents filling the air. Ahead of us, and in the valley, lay a small forest of plants and trees; a deep blue swimming pool at its heart. Surrounding this were large tents arranged for dining and lounging, each filled with vases of fresh flowers and large, decorated cushions. Overhead, nesting birds sang and chirped, as beautiful statues and artwork glittered in the sunlight. At the camp’s summit – overlooking the towering mountain range – was a bar; a place to watch the sunset with a beer in hand. It was perhaps one of the most incredible places that I’ve ever stayed. 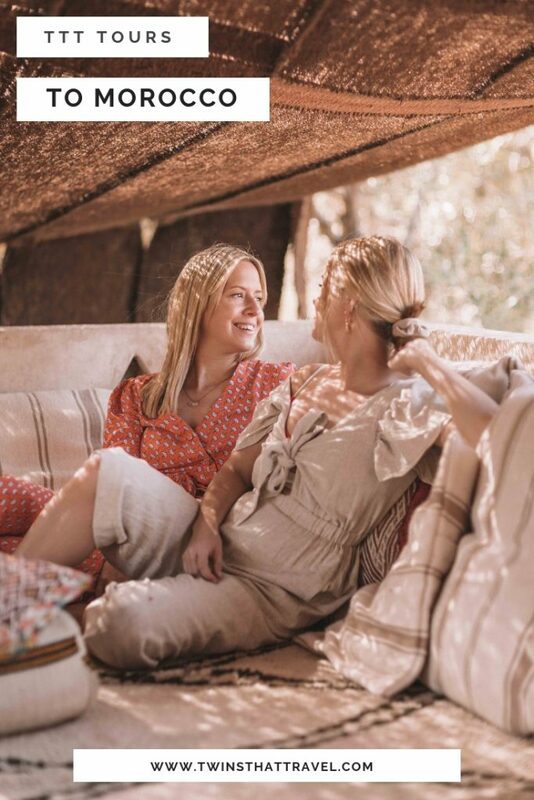 Having settled into our relative tents (each complete with beautiful en-suite, shower and hot water), and after a lazy afternoon spent reading under the shade of an olive tree, we came together for an evening adventure: a camel ride through the dunes of the Agafay Desert. Included in the price of our stay, the camel ride promised a distinctly Moroccan introduction to desert living: one complete with the odd grumble from our loyal steeds. 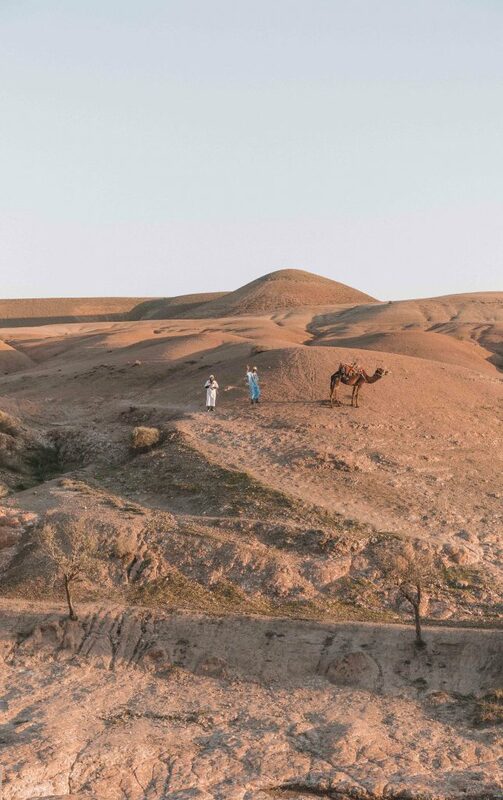 Climbing the dusty hill to where our ride would begin, we were greeted by the sight of ten patient camels; each silhouetted by the late afternoon sun. Decorated in brightly sewn blankets and saddles, and with traditional berber guides, things suddenly felt very Lawrence of Arabia. 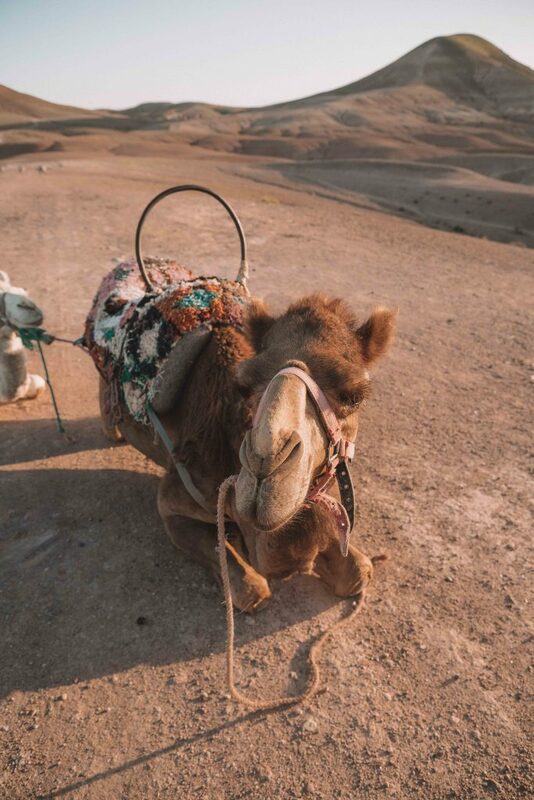 After a few screams and some hysterical laughter, we were finally aboard our camels – setting off towards the horizon where the evening sun waited for us. The ride lasted an hour and our shadows grew steadily longer as we walked. Around us, stars began to settle in the sky as we rocked gently back and forth – our very own Arabian Nights adventure underway. After awkwardly dismounting from the camels (our hips not quite used to that particular mode of transport), we gathered at the top of the dunes to watch as the sun set, the earth turning from a ruddy red to a cool blue. Overhead, the stars were unbelievably bright – the desert providing us with some of the clearest skies I’ve ever seen. One of our group even had an app to show where we might see the Milky Way – its ‘core’ passing directly over the camp as we slept. As darkness fell, the camp below us came alive with the flames of flickering candles and open fires. The air smelt like charcoal and incense. Walking down towards our dinner tent, we could hear the sound of drums and saw a flash of a belly dancer; the evening’s entertainment beginning. 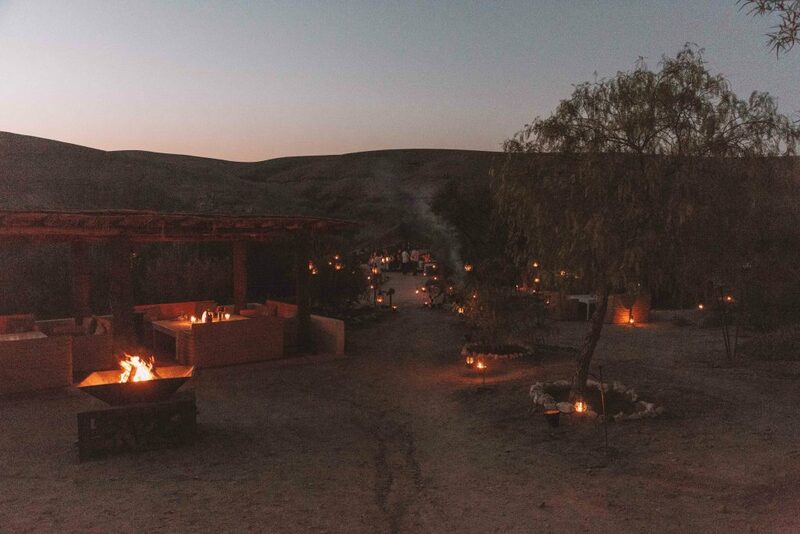 Under the warmth of our own tent, and over the glow of candlelight, we were served with baskets of bread and steaming tagines, the chatter of our group filling our tent. It was perhaps the most perfect end to a brilliant afternoon in the wilds of Marrakech’s desert. Included: transfers back to Marrakech, lunch with Tariq, dinner at Al Fassia, a night at 2Ciels Hotel. The next morning, I woke to the sound of crowing cockerels from the neighbouring village. Outside, the desert sun already felt warm, our tent glowing softly. Looking around at our spacious surroundings, I concluded that staying at La Pause was definitely not the camping experience I’d been expecting. Instead, it felt like a luxury hotel experience in itself, complete with comfortable, thickly quilted beds, warm heaters and delicately scented toiletries. I only wished we were staying another night. Joining the others at the main camp, we were treated to a delicious breakfast of eggs, delicate pastries and fresh fruit. Of course, the obligatory pots of mint tea also arrived, alongside glasses of freshly squeezed juice. The camp’s resident dog – a giant Turkish sheep dog – wandered over and collapsed lazily next to us; one eye on any crumbs that we might drop. After breakfast we had the morning entirely to ourselves. As some people slept by the pool or read, I explored more of the camp: photographing hidden artwork and sleepy hammocks before it was time to leave. Our convoy of black SUVs waiting, we reluctantly left La Pause behind and returned to 2Ciels Hotel, where we would enjoy a free afternoon. En route, Tariq took us to his own home, which was an incredibly kind gesture. Beckoning us into his house, we were shown into his reception room: an immaculate space decorated with colourful curtains and delicately sewn table cloths. Settling down on the comfortable sofas, Tariq’s mother appeared in the doorway, shortly followed by his brother. Together, they presented us with endless plates of M’smens and delicate pastries, as Tariq began the traditional tea ceremony. Our stop here was not planned and came as a complete surprise to everyone. 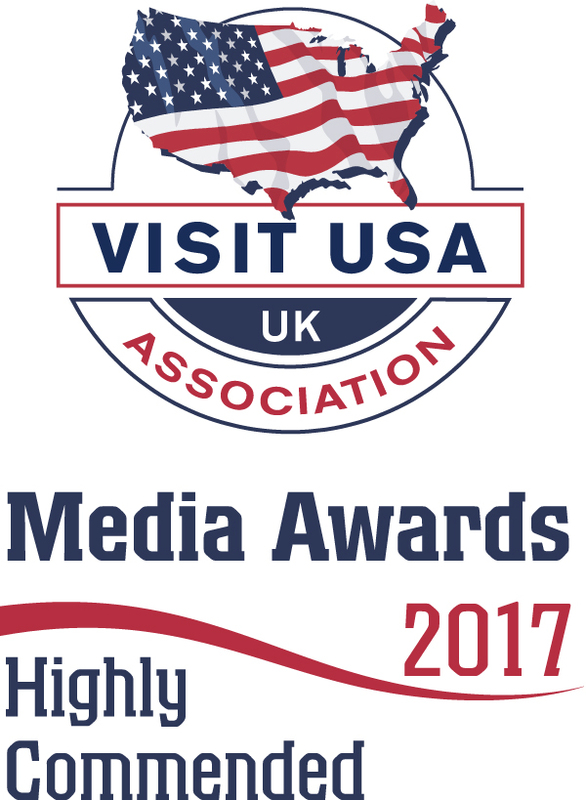 It also confirmed just why we had chosen to work with Intrepid Travel’s own brilliant guides. Following our final afternoon in Marrakech – one spent shopping and lazing by the pool – we prepared for our final night in the city. In keeping with the ‘all female’ theme of our tour, our dinner could not have been at a more apt spot: Al Fassia – a restaurant run entirely by female staff. Al Fassia, roughly translated as ‘the women from Fez’, is a restaurant run and owned by sisters Myra and Saida Chab. Dedicated to providing authentic Moroccan cuisine (much of which is derived from the city of Fez), it also ensures that all guests are met and served by women only. As they say: ‘women are in charge of this house’. It was an incredibly positive and warm place to spend the final night of our TTT Tour to Morocco; and offered the chance to thank everyone for joining us. Most importantly, it was also an opportunity to raise our glasses to Tariq – the person responsible for ensuring that our five days in Morocco were full of laughter and (at times terrible) jokes. As the gardens of Al Fassia swayed gently in the evening breeze and our group shared final stories from the trip, I felt both incredibly happy and unbelievably sad – our first TTT Tour complete. The day that had initially seemed weeks away when we first landed in Morocco was finally upon us: one dedicated to warm hugs and sad goodbyes. As the many ladies in our group jetted off in different directions, we had just enough time for one final poolside hour, before reluctantly packing our bags to leave. With some of the group staying on in Marrakech for a few more days, whilst another headed to the coastal resort of Essaouira, I realised how much I’d miss everyone as our minivan door closed. 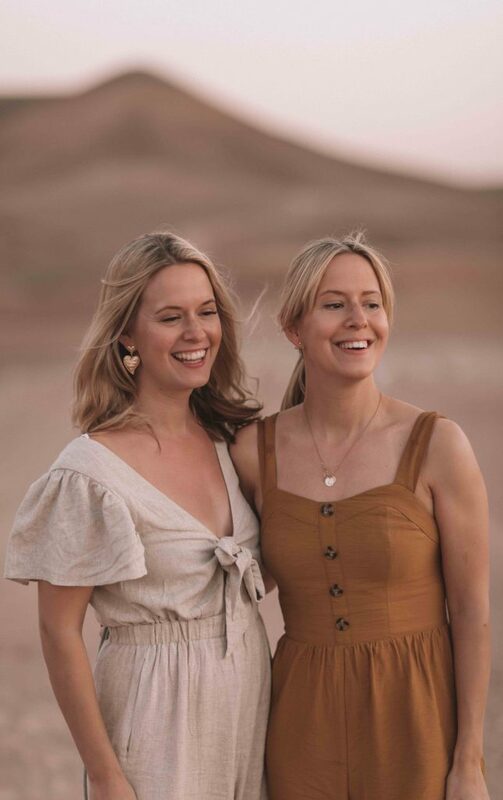 Our time in Morocco had been a whirlwind experience: one filled with new experiences and most importantly, new friends. Waving through the fogged glass as we left for the city’s airport, I realised that our first TTT Tour had been everything I’d hoped and more: a chance to finally take our online community offline, and empowering women to see the world together. With in-country initiatives such as Al Fassia and Atelier Chef Tarik, our tour had felt even more special – a truly all female wonder group. We cannot wait to do it all again. 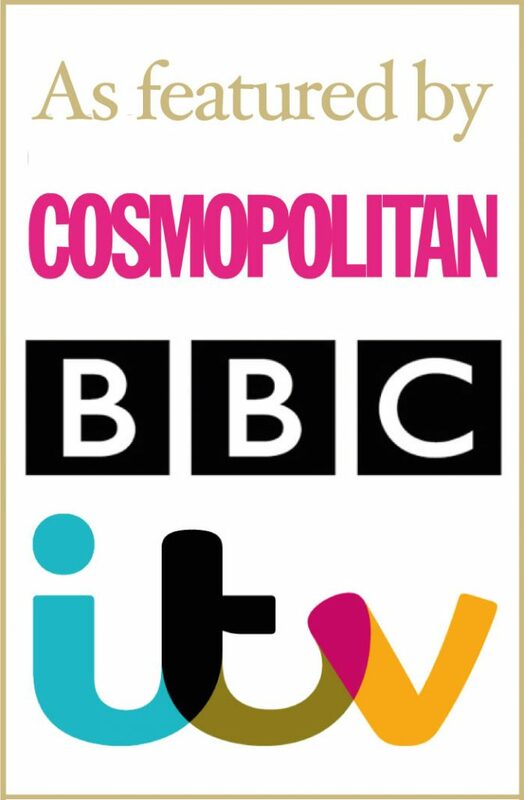 For details on upcoming TTT Tours, click here. All trips are supported by Intrepid Travel and include transfers, accommodation, experiences, the majority of all meals and guided tours. "An Analogue Stay at 25hours Hotel, Vienna"
Be the first to hear about our latest TTT Tours.